G.P.Gillespie offers a variety of different solutions beyond our training and consultancy services. 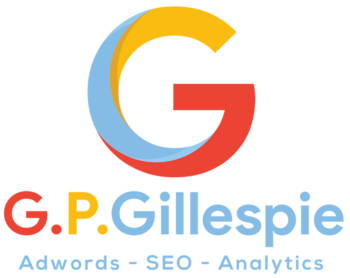 As well as the bespoke one to one training consultancy and group training, G.P.Gillespie offer digital marketing solutions for business of all sizes and scales. These include SEO, Google Adwords and Google Analytics. Below is an outline of those services offered by G.P.Gillespie. For more details on these services visit the relevant webpage. SEO, or "search engine optimisation", is the method of ensuring that certain pages on websites are ranked on search engines. Not only do they want to rank they, ideally, want to rank as high as possible on googles 1st page. Depending on the type of industry and alongside the level of competition and demand for particular "keywords" this can range in difficulty. In essence websites need to be optimised for certain keywords and then long term work is done to promote that page to a high position on google. CPC, or "cost per click" is the method of creating targeted adverts on google so when a potential customer searches for a selected term, an specify advert appears (as highly as possible) on google. This method of advertising is instant. As soon as an advert and campaign is created, that advert can start appearing on google. So in comparison to SEO, it can be instant but it can also be expensive. Google Analytics is a tool by which we can measure the effectiveness of various digital marketing channels as well as evaluate the overall performance of a website. The principle of "if we cannot measure it, we cannot manage it" is the main reason for having Google Analytics installed on a website. All of our CPC and SEO services come with Google Analytics as standard.